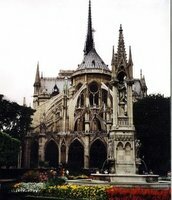 The Cathédrale Notre Dame de Paris (Notre Dame Cathedral of Paris) is a beautiful and imposing Gothic cathedral that stands on Île de la Cité. Although the hunchback did not actually live here, it was this tale by Victor Hugo that saved the cathedral from destruction and immortalising it in words. Taking nearly two hundred years to build, the construction of Notre Dame began in 1163 and was completed in 1345. In the next few centuries, between riots and misguided notion of cathedral modernisation, the cathedral suffered damages but not as heavily until French Revolution took place. It was looted and many of its treasures destroyed. The publication of The Hunchback of Notre Dame in 1831 brought forth attention from across Europe, its popularity attracting visitors to flock to see it. Ultimately this spurred the restorative effort in the mid-19th century, giving us much of the current appearance of the cathedral that many have come to admire and appreciate. Since 2000, a major cleaning effort on the west façade of Notre Dame has been underway, removing centuries of filth mainly from massive industrial activity. This meticulous cleaning process is accomplished with the use of lasers and countless tiny brushes. Today Notre Dame is one of the most popular sights in Paris and of France. The hours may vary according to exceptional celebrations. This is a working cathedral and mass are held daily. Priests are also available for guidance and confession. Please consult this page for more information. Last access 45 minutes before the closure. The entrance for the visit of the tower is located outside of the cathedral, on rue du Cloître Notre-Dame. The tower is managed by the National Monuments Centre. The number of visitors at any one time is limited to ensure comfort and safety, so the queueing time may be long. Access to the cathedral and its treasury is free of charge. Free for anyone under 18 years of age. Free for 18 to 25 years old who are citizens or legal residents in the EU. There are 387 steps to ascend the tower and no elevator/lift facility available. A number of free guided tours are available in different languages, organised by the Cathedral of Notre-Dame de Paris and the C.A.S.A. (Communauté d’Accueil dans les Sites Artistiques) Association. A number of sacred concerts and recitals are organised, of which some are free while others are ticketed. For more information, consult the page of Musique Sacrée à Notre-Dame de Paris. The eateries adjacent to the cathedral are somewhat overpriced, crowded with tourists and mediocre in terms of quality. Cross the river over to Quartier Latin for more options. The famous ice-cream maker, Berthillon, can be found on Île-St-Louis (next to Île-de-la-Cité). The following sights are all within walking distance from the cathedral, and in fact are all found on Île-de-la-Cité itself. Point Zéro just in front of the cathedral is a mark from which all distances are measured in France. Musée Notre-Dame is a small museum dedicated to the cathedral of Notre Dame de Paris and its archaeology, located adjacent to the cathedral. Square Jean XXIII is a pleasant garden behind Notre Dame, running alongside the river. Paris Mémorial de la Déportation at Square de l'Île de France commemorates the deported to Nazi concentration camp during World War II. Crypte Archéologique under the Parvis de Notre-Dame de Paris was built to protect the ruins discovered during the excavations that began in 1965. La Conciergerie was used as a prison during the French Revolution, and Marie Antoinette was imprisoned here until her execution. Sainte-Chapelle is likened to "gateway to heaven" with its kaleidoscope of stained-glass windows that portray over 1000 religious scenes. Marché aux Fleurs and Marché aux Oiseaux is the most famous flower market in Paris, offering beautiful and colourful blooms all year round, of which the cacophony of bird market takes over every Sunday. Pont Neuf is not as new as suggested by its name, and is in fact the oldest and the first stone bridge to be built without houses on it. This is version 1. Last edited at 1:33 on Dec 1, 09 by lil_lil. 3 articles link to this page.